If so, then it's time to PLAY BALL with Out of the Park Baseball, the award-winning baseball simulation game for Windows or Mac. 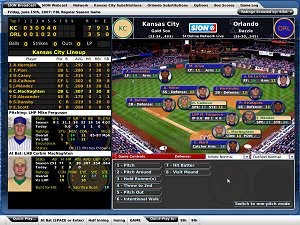 We're so confident that you'll love this series that we're now offering the 2007 version of our game, OOTP 8, FOR FREE! There is no catch! This free version of OOTP 8 is fully-functional, with no restrictions of any kind. This is the Metacritic PC Game of the Year 2007, and their second highest rated PC game of all time!